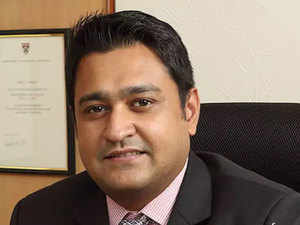 Both Indian investors and distributors are waking up to the stability and diversification offered by a fund with a significant exposure to foreign equities, Neil Parikh, CEO, PPFAS Mutual Fund, tells ET Wealth. Your only fund offering, Parag Parikh Long Term Equity, has built a five year track record. How has the journey been so far? It has been an interesting journey to an AUM of ₹ 1,000 crore. We started around 2013, when we converted from a portfolio management service to a mutual fund structure, because the minimum investment threshold had been raised from Rs 5 lakh to Rs 25 lakh. We had to tell a lot of our clients to either top-up their investments or redeem them. This didn’t sit well with us. At that point, global markets were doing really well and we were already investing in them. The MF allowed us to invest in international stocks in a much more tax efficient manner. It was also operationally easier to run a MF entity. We also thought there was a need for a structure where one could do everything within one scheme. Distributors were initially reluctant to come on board as they were unsure about our concept. But over the past couple of years, we have seen a pick-up in distributor engagement. We have proved that this model works. The scheme allocation is unique, with 35% allocation towards international equity, which allows us to tap global opportunities. This has lowered volatility and given reasonable returns over the long term. Are investors comfortable with the exposure to foreign equities? Investors perceive it as a very different fund. India’s market capitalisation as a percentage of world market cap is only 2%. So 98% of the opportunities actually lie beyond our borders. Companies like Google or Apple are not available for investment in India. Investors are realising that they need such opportunities. If India is doing badly, our fund will typically outperform. It won’t be affected by a bad monsoon or elections. So it helps distributors round off their clients’ portfolios, offering them actual diversification. Considering the high exposure to foreign stocks, do events like global trade wars and tensions in the Middle East play a role in the investing process? We practice bottom up stock picking. We keep an eye on global developments, but don’t pay too much attention to the macros. We are looking at companies on an individual basis. Google, for instance, is not going to be affected by trade wars and will continue to do well. Every week there is some news flow. It is important to keep the noise out and stick to what you know. Why have you categorised the fund as a multi-cap fund and not a value fund? We had two choices—either to opt for a value fund classification or a multi-cap offering. We opted for the latter as the mandate is much larger, even though we have imbibed the value investing philosophy. Besides, we weren’t very sure about the regulator’s definition of value. We didn’t want to be constrained by someone else’s definition of value. Being in the multi-cap category puts us in clear waters. If you see our portfolio, we have mega-caps, large-caps, apart from some mid-caps and small-caps. Why are you holding a high amount of cash in the fund? We are currently holding 24% cash in the fund, mostly in arbitrage positions apart from cash and cash equivalents. The reason is not that we are bearish on the market or we are waiting for a fall. Towards the end of last year, we thought the markets were a bit overvalued and some of the mid-caps particularly were richly valued. Wherever we felt the need, we booked profits. We have not been desperate to redeploy that money. We will invest when and where we find value. Are you planning to expand your product suite in the future? We are launching a new scheme—a plain vanilla liquid fund. The reason is to enable investments into the main equity fund. The feedback we got from our distributors and clients is that a liquid fund would help them initiate a systematic transfer plan to the existing equity fund. We were probably losing out on some SIP money into the equity fund as a result. Earlier, we were not in a position to launch another scheme, as we were falling short of the ₹ 50 crore minimum net worth criteria fixed for an MF company. But now we are comfortably placed on that front. The next logical step would probably be to bring an ELSS into the mix. Equity will remain our core focus; this is just an enabler for the main offering. Going forward, if we are to launch another equity scheme, it will have to be a differentiated offering—a fund I would be excited to put my own money into. What is the right approach for investors at this juncture? Investors had not seen volatility for a long stretch of time until a few months ago. It was mostly a one-way uptick in the market. I believe volatility will make its presence felt. We are approaching the election year. Lot of news flow will be coming in. Investors should do the simple things. If you are doing an SIP, just continue with it. There is no better asset class than equities for long-term wealth creation. If you can, buy on market dips. Sometimes volatility actually gives you more opportunity to invest in the market. If you have a five-year horizon, you will make money. Download SID/SAI and KIM here. The original interview could be seen here.